Philip James Bailey (born May 8, 1951) is an American singer-songwriter, percussionist and actor. He was one of the lead singers (along with group founder Maurice White) of the band Earth, Wind & Fire. He has won seven Grammy Awards. He has released ten albums, including Chinese Wall. He also performed the duet "Easy Lover" with Phil Collins. Bailey was born in Denver, Colorado. He has been married twice and has six children. ↑ "Philip Bailey Biography". biography.com. Retrieved February 6, 2016. 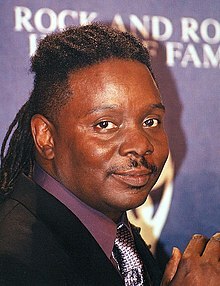 Wikimedia Commons has media related to Philip Bailey. This page was last changed on 4 April 2019, at 17:57.